From the start, Took a Leap Farm has been focused on selecting and breeding for outstanding dairy characteristics and productivity, general conformation, and good health. Our initial investments in our herd included goats from some of the most respected Nigerian dwarf breeders in New England and beyond. We’ve built upon this foundation, making careful breeding and management decisions to continue the legacy of our beautiful herd. ADD a LITTLE GOAT to YOUR LIFE! 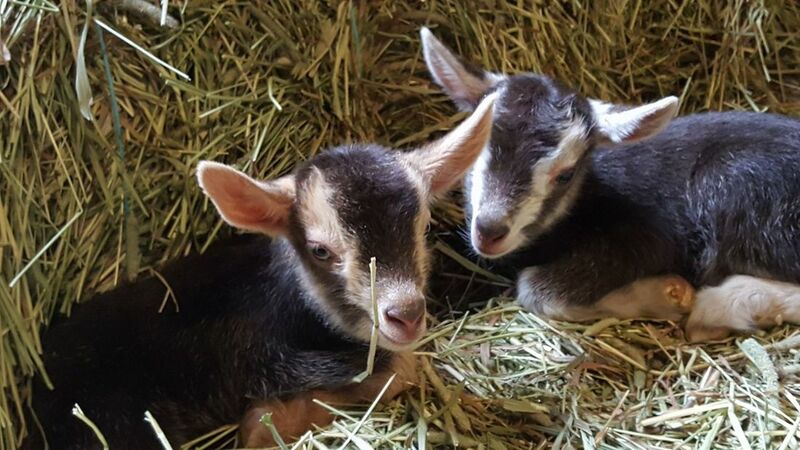 Smaller than most goats, Nigerian dwarves are easy to handle, sweet-natured, and require less space than their larger counterparts. They make wonderful easy-care pets and are an ideal livestock choice for small-scale dairy farmers like us. CAE, CL, Johne's, brucellosis, and tuberculosis. ​Our 2019 kidding season plans have been finalized - PHEW! Check out our herd and impending new arrivals below. ​we've been very selective in choosing bucks for our breeding program, with obvious results. Collectively, these gentlemen have made enormous contributions to the quality of our herd. even though it is our busiest! Took a Leap goat to your farm! ​The County Co-op & Farm Store, our products have become a local favorite!